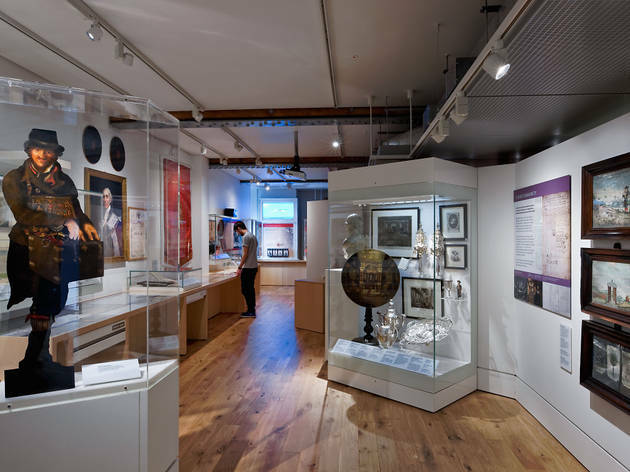 Opened in March 2010 after a ten-million-pound transformation, the Jewish Museum London features displays and exhibitions that tell the story of Jewish history, culture and religion and reveal how the Jewish community has made a vital contribution to British life. Displayed across four permanent galleries are historical and contemporary objects, films and personal stories that explore immigration and settlement. Packed with plenty of hands-on, interactive displays, the museum’s four new galleries offer a wonderful snapshot of Jewish British life, as well as exploring general issues surrounding contemporary immigration. London’s Jewish history is beautifully evoked in displays such as the recreation of an East End tailor’s sweatshop or the photographer’s studio in which visitors can pose in period wedding outfits – or you can practice your best Yiddish insults at the Yiddish karaoke booth. There is also a thirteenth-century medieval mikveh (ritual bath), on show for the first time since its discovery in the City of London in 2001. The Holocaust Gallery explores the impact of Nazism through the experiences and personal items of Auschwitz survivors. In the 'Judaism: A Living Faith' gallery, newly-commissioned films reveal a range of contemporary Jewish families celebrating festivals and Jewish lifecycle events. 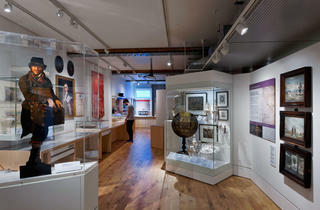 Offering a lively and imaginative events programme, the space looks set to become a London museum landmark. A really nice museum mixing permanent exhibitions about Jewish culture and religion and temporary exhibitions about related themes. I went there last week to discover the Astérix exhibition (not Astérix only actually, more like an exhibition about Goscinny who was Jewish himself) and was pleasantly surprised to discover a lot about those comics I have known since being a child. The best part of this exhibition was old Goscinny's drawings dating back from when he was just 16 which already showed his immense talent. The other two floors are the ones of the permanent exhibition which are also very interesting but a bit too crowded in terms of information (which contrasts a lot with the Astérix exhibition which is really spacious). So I would recommend some break/coffee time in between floors or while visiting the 2nd floor especially to be able to focus on information a bit better. Overall a nice museum! In my opinion, it's nowadays vital to learn about different faith' and cultures and the Jewish Museum is a great place to dive into history. Given it's size you won't be swamped with information - it's just enough to develop an understanding of Jewish history. To mix up your visit it is worth checking their website for any events. I visited the museum as well as a Gemma Cairney talk (which was brilliant) and it turned out to be a perfect mix of history, as well as present. Don't be scared by the name, this museum is an interesting visit for absolutely anyone. Focusing on British Jews, it gives a wonderfully engaging account of Jewish history. Some arresting bits and some more hard-hitting but all interesting. And if you're not an history fan, they also do events and talks that are really worth a visit. The Laura Bates session as part of the Women's Empowerment Festival was excellent. So do keep on eye on their offering! A lovely little museum that explores and explains Judaism in a way that welcomes people from all faiths. Much of the museum focuses on the proud heritage and culture of British Jews, but the years of persecution are by no means hidden - perhaps most powerfully with the Holocaust Gallery dedicated to Leon Greenman OBE's horrifying story of how he was separated from his wife and baby to be sent to Auschwitz, a fate which only he survived. Many will come for the top floor dedicated to Amy Winehouse, which personally I found a little disappointing. Accompanying you through the room are excerpts from her application to Sylvia Young school of performing arts, but I struggled to get much more insight or understanding of Amy beyond that letter she wrote before the headline tours, platinum albums and heartbreaking early death. The museum often hosts events, and as part of their 'You Know I'm No Good: Young Women's Empowerment Festival' we were lucky enough to attend a fascinating interview with Everyday Sexism founder Laura Bates about the rise of gender neutrality. A really interesting afternoon out and certainly worth a visit the next time you're in Camden. I hadn't heard about the Jewish Museum before my visit (altough I should have guessed that a place like this exist in London...I think it's possible to find a museum of anything in London), but I'll definitely recommend a visit from now on. I spent a lovely afternoon there: I especially liked that some parts of the permanent exhibition were linked with personal stories / interactive elements. The temporary exhibition about Amy Winehouse was touching and made me feel closer to her. I always thought of her as a great performer, but to see old photos, read quotes of teenage Amy and memories of her brother created a clearer picture about not the superstar, but the ordinary person behind it. Hidden away from all the hustle and bustle of hectic Camden, is a little North London gem. What a fabulous find. Never too busy and the staff are more than willing to show you around. Thought I wouldn't spend that long here but actually spent a couple of hours. Lovely cafe and gift shop, perfect for picking up some Amy Winehouse memorabilia too! This museum is hidden away from the chaos in Camden. 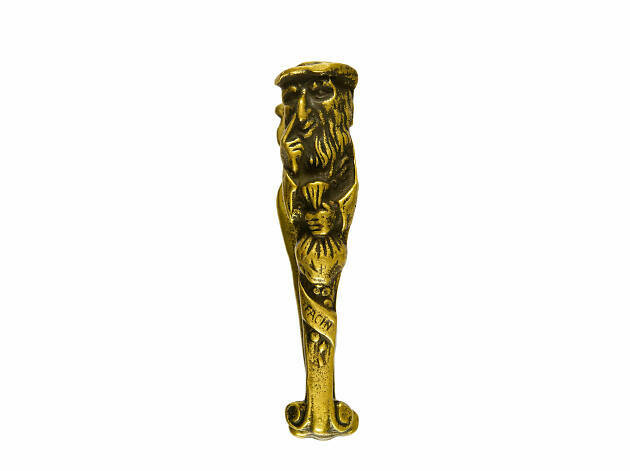 It is a townhouse containing Jewish history and artefacts spread over 2 floors. The first floor has Jewish ancient history and religious objects while the second floor has more modern migration history. Some of the staffs are volunteers but they are clued up and friendly. I came away learning a lot about the Jewish beliefs. There is a simple cafe on the ground floor where people can have light refreshments. In my opinion the visit could be easily completed within 2 hours. This is a very smart little museum tucked away just far away enough from the chaos of central Camden to offer a quiet retreat and a fascinating insight into the Jewish history of the area and London as a whole. With a well-curated assortment of varied artefacts and presentations across numerous levels as well as a coffee shop and cafe, it makes for a worthy destination for those curious on London's history. I explored the museum while attending a late event linked to the Amy Winehouse: Icon Event which features Amy Winehouse: A Family Portrait which is running until September 24th September and the artwork Pegasus: Love is a Losing Game’ which is on display until June 4th. The exhibition gives a real insight into Amy's family life and background and is well worth a visit for this alone. Hidden in a surprisingly calm street very close to Camden High Street, the visit to the museum was a treat! I went for a very small but very beautiful photograph show, and was impressed by the other (a little bigger) also temporary exhibition. The permanent displays, about Jewish traditions and their history in England, is rather well executed, with interesting content, but not every interactive materials were working, and some of the informative texts were quite childish. I wouldn’t recommend going there just for the permanent exhibition, but if going there for one of the temporary ones do go with extra time to enjoy all the museum has to offer. Exceeded my expectations. I thought I'd only spend a short time here but ended up spending a least a couple of hours. One floor gives a detailed and compelling history of Jews in the UK, another provides an overview of Jewish religious festivals with artefacts, and finally the sobering Holocaust Gallery tells the incredible story of Auschwitz survivor Leon Greenman, who survived six concentration camps.